The firm posted its lowest annual trading revenues since 2005. Goldman Sachs Group Inc. ( GS) reported a 7.1% drop in profit as revenue from fixed-income trading declined for the fifth time in six quarters. Net income fell to $2.17 billion, or $4.38 a share, from $2.33 billion, or $4.60, a year earlier, the New York-based company said Friday in a statement. The average estimate of 23 analysts in a Bloomberg survey was $4.36. 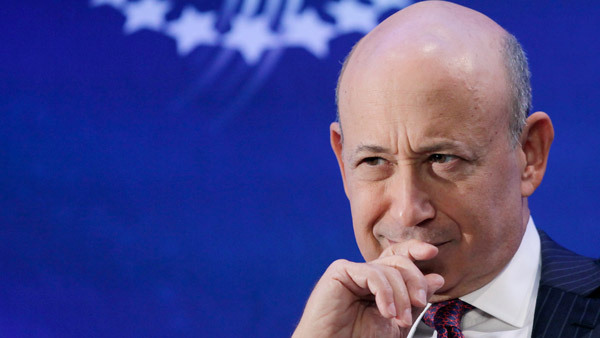 Chief Executive Officer Lloyd C. Blankfein, whose firm is the most reliant on trading among the biggest U.S. banks, has seen revenue from that business drop in each of the past five years. Top banks all saw declines last quarter as oil prices plunged to the lowest level since 2009, interest rates fell the most in two years and credit spreads widened. The three largest U.S. banks — JPMorgan Chase & Co., Bank of America Corp. and Citigroup Inc. — posted their worst combined quarterly trading revenue since 2011, led by a 23% drop in fixed-income, currencies and commodities, or FICC. In the first half of the year, executives bemoaned markets that weren’t moving much, giving clients little reason to trade. That reversed in the fourth quarter, as oil prices plunged to the lowest since 2009, interest rates fell the most in two years and credit spreads widened. Goldman Sachs fell 1% to $178.49 in New York trading yesterday, its fifth straight daily decline. The stock has dropped 7.9% this year, almost erasing 2014’s gain of 9.4%. Goldman Sachs’s investment-banking division has helped counteract the firm’s trading-revenue decline. The unit’s fees from advising on mergers and underwriting debt and equity jumped 17% in the first nine months of the year. Goldman Sachs held the top spot among arrangers of global equity, equity-linked and rights offerings in 2014, according to data compiled by Bloomberg. It ranked first in advising on announced mergers and acquisitions and fifth in underwriting U.S. bonds, the data show. Last month, the bank named John Waldron, global head of investment-banking services and client coverage, as the third co-head of investment banking with Richard Gnodde and David M. Solomon. He replaced John S. Weinberg, one of the unit’s longest-serving leaders who’s taking a new role to strengthen relationships with clients. The firm has sought to entice investors through buybacks and dividends. Goldman Sachs increased its quarterly dividend to 60 cents last year and bought back $5.6 billion of stock in the 12 months ended in September.